LUBRICATES TO HELP EASE PAIN: Our high-molecular weight hyaluronic acid (also known as hyaluronan) matches the body's own synovial fluid for maximum absorption and joint relief. Our patented daily HA joint supplement of pure hyaluronic acid works to help ease sore joints, aches, pains and inflammation associated with arthritis, aging or injured joints. SHOCK ABSORBER FOR BETTER MOBILITY: Those who suffer from injuries or joint-related disorders know how hard completing normal, everyday activities or staying healthy and fit can be. LubriSynHA, which is bio-identical to the synovial fluid found in joints, holds the lubricating moisture in joints and cartilage, maintaining their cushioning properties and fluid motion. MAINTAIN THE ACTIVE LIFESTYLE YOU WANT: Even if you don't suffer from arthritis pain, we know the natural progression of aging can negatively affect an active lifestyle. Taking a daily liquid source of hyaluronan ensures the integrity of the synovial fluid, giving support to healthy joints and connective tissue for years to come! 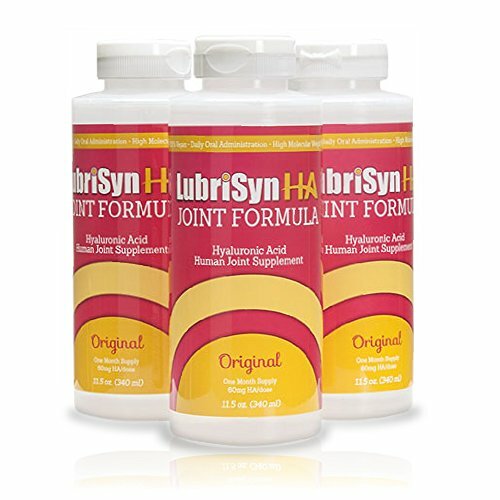 JOINT SUPPLEMENTATION MADE EASY: Our joint supplement gives you 60mg of hyaluronan in each serving. Our maximum-strength formula helps cushion joints naturally, and our new joint formula is 20% more potent. Because hyaluronic acid must be taken daily for maximum effectiveness, our liquid joint supplement is available in a convenient three-month supply. HYALURONIC ACID YOU CAN TRUST: LubrisynHA is all-natural, 100% vegan and gluten-free, and our bottles are BPA-free. Our hyaluronic acid is extracted from a non-animal, microbial source, resulting in high-molecular weight purified hyaluronic acid. This bio-identical synovial fluid most closely matches the hyaluronic acid found naturally in the body. Our FDA-registered facility is GMP-certified, and our products are manufactured in the USA in small batches to ensure the highest quality. If you have any questions about this product by Lubrisyn, contact us by completing and submitting the form below. If you are looking for a specif part number, please include it with your message.